1. In a large non-stick skillet over medium heat, brown tofu on all sides. This will take approximately 5 minutes per side, depending on how crispy you like it. Deglaze with the tamari and set aside. 2. I actually parallel cooked in another skillet as the tofu did its thing. You could also use the first pan if you wanted to wait. So in a large skillet over medium heat, heat oil. Add green onions and saute until browned, around 2-4 minutes. Stir in ginger, garlic and carrots, sprinkle with salt and saute for 3-4 minutes. Stir in broccoli and red pepper and saute for another 4-5 minutes until the broccoli turns a brilliant green. 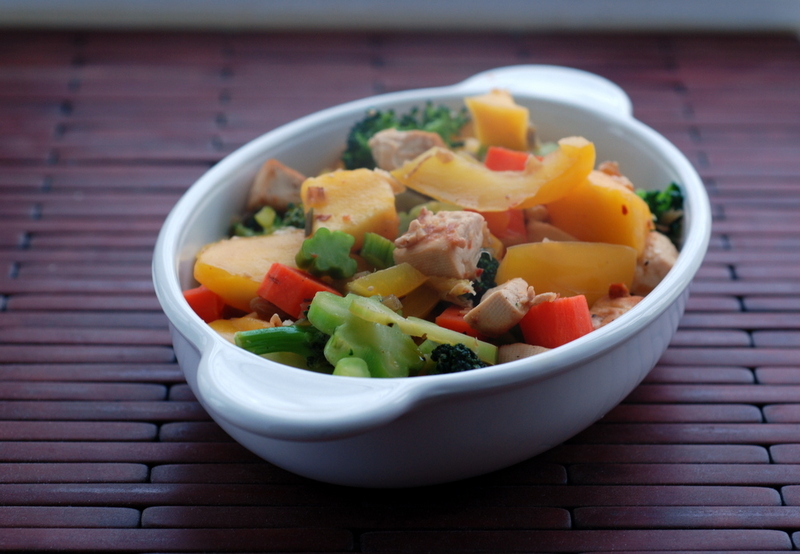 Stir in mango and cooked tofu and heat through for one more minute. If things are sticking, deglaze with a bit of water. 3. Deglaze with the orange juice and stir in the lime juice, garlic and pepper flakes. Heat from another minute, until warmed through. Season with salt and pepper, to taste. Serves 4, with a side of rice to sop up the juices. I live curries with a hint of sweet. Mangoes are all over my farmers market. It’s Avery international market with many Indian patron. There is an aisle probably 12 ft long stacked with them! Ooo!!! I’ll have to keep an eye out for them! 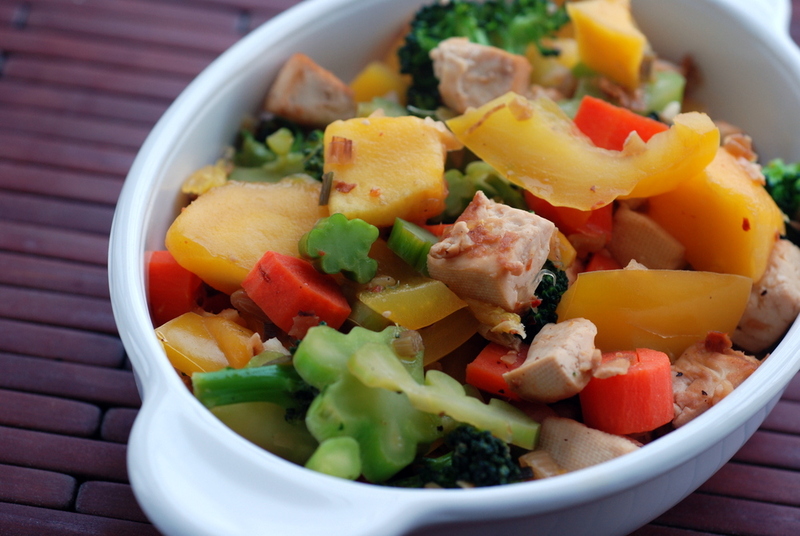 I love mangoes and curry together so this stir fry definitely sounds good to me! Sometimes I really think you must be Australian at heart. I don’t think I’ve ever seen alphonso mangoes before! Although the stores around here do normally carry more than one variety…so I’m definitely going to have to watch out for them. 🙂 Mango sounds perfect with spicy curry! 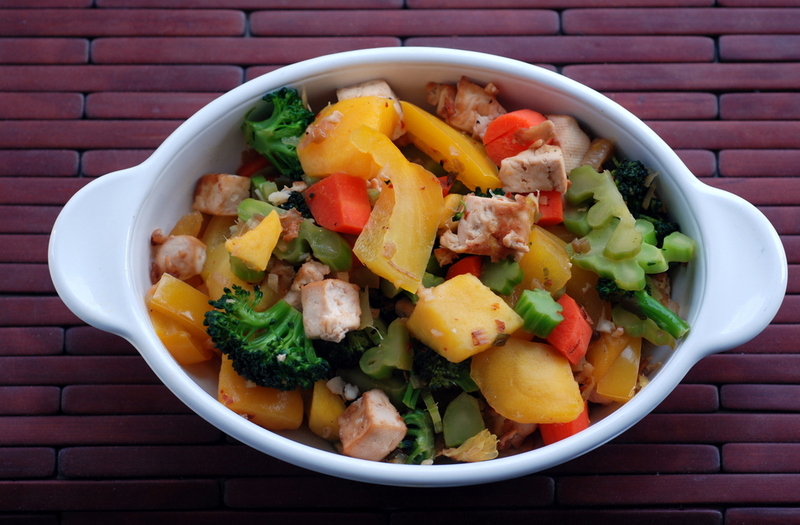 Love any type of mangos.Mango with broccoli and tofu is an interesting combo. Surprised you aren’t using Thai chili paste in this, but sound like you wanted a more orange type sauce. While we are on the subject of mangos, I could swear you recently posted a dessert recipe that used both fresh and dried mangos. I dutifully bought dried mangos, but now doing a search, I can’t find it on your blog. Was I imagining this? I guess it could have been on another blog—I do look at others, although yours is my absolute favorite. Oops–never mind—to reassure myself that I haven’t (completely) lost it, I kept searching and found the raw tropical mango pie from May 2011. Definitely in my future! I fell in love with the combination of tofu, mango and spice over summer and you are making me miss it after, oh, a month without the trio 🙂 This looks great! Hope the riding is going better! Getting back your stamina? I feel like today would have been a nice day for riding despite the rain because the wind was warm!